10/10/2015: Sorry, we forgot to post our changes, but we have been releasing things every 2 weeks. 9/3/2015: Happy September! We have had some big changes (and some big bugs) but that is what Beta is for. Hopefully issues have been fixed. Effective immediately, Redemptions will be paid out on Mondays and Fridays. Submissions before 11:59 PM CST Monday will be delivered on Friday. We are still striving for emails to be responded as quickly as possible. We are now accepting applications for mobile testing. Please contact support if you are interested. 9/3/2015: As part of our commitment to our advertisers to deliver the highest quality human traffic, we will be implementing site-wide IP bans on major data centers. If your IP becomes blocked, please send us an email with your IP and we can add it to the whitelist. 9/3/2015: We have revamped the redemption process to provide more security. We are using 2-factor authentication, similar to the technology used by Google and major financial institutions. We only accept landline and mobile lines from the USA at this point. We do not accept VOIP or other services such as Google voice, Skype, etc. 7/4/2015: Happy 4th of July! In celebration of our Nation’s birthday, all honey and nectar earned from BeeTV and BeeGames will be doubled until July 5th. 7/2/2015: We just rolled out viewability metrics across both the game and BeeTV products. Users will now have the same information as advertisers. Favicon will alert you when an ad is playing. Only works on Chrome/Firefox. On IE, all tabs will show the alert. As the data for the favicon change comes directly from the ad networks, it might not be 100% accurate. Users will receive bonus honey when an ad is viewed according to IAB standards (2 seconds viewed, window is in focus). Specifically, at least one circle has to be green to receive the bonus. We are currently working on the ad waterfall. For a while, users might experience a decrease in the fill rate since only one ad tag is called. This is a problem with our Content Protection module, and we are working hard to fix this problem. The “service unavailable” errors should be resolved. Please let us know if you are still getting this issue. 7/1/2015: People are seeing “service unavailable” errors. This is easily fixed as a temporary solution. Just clear your EarnHoney.com cookies. We will have a hot fix later today so only the users with a large number of open browser tabs will be impacted going forward. Partnering with industry leaders like Distil Networks to improve network capabilities. Over the next few days, there might be some glitches as we work to improve your earning experience. 1. Clear your browser cache and relogin. 6/22/2015: One of the ad partners is putting surveys after ads. We did not agree to this, and understand that this will adversely affect earnings by the EH community. While we work out this, just click on “Skip Survey”. The honey will be rewarded after the survey is bypassed. 6/19/2015: Greetings! We have temporarily removed display (banner ads) while we figure out how to block additional videos from playing. The secondary videos, through Google, are mostly CPC so they do not bring in much additional revenue anyway. Once we have figured everything out, we will adjust payouts accordingly. Popular VPS/VPN has also been blocked from accessing EarnHoney as they are against the Terms of Service. 1. Dramatically increased payout for ads that are viewed. By IAB standards, a viewed ad is one which is in-focus, above the fold, for 2 consecutive seconds. Users who watch these ads will be rewarded 2x-4x current rates. 2. Decrease the payout for ads that are not viewed. 3. Human behaviours such as having user cookies, coming in from referral sites, mouse hovers and movements over advertising will be monitored. 4. Users who persistently display non-human or extremely passive characteristics such as having proxy or hidden IPs, not coming from a referral site, no site interactions, or employing cloud VPS / VPN / proxy technologies will not be allowed. 5. Increased emphasis on fun opportunities to earn more honey. Please send support any ideas that you might have on what would be fun for you. 6. Increased opportunities with partnerships with other websites to earn while watching videos on partner sites. 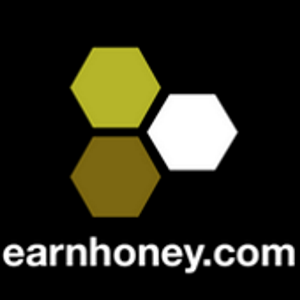 Thank you in advance as we work to make EarnHoney better for everyone, so we can all earn more money. 6/17/2015: We are happy to be working with industry leaders like Moat Analytics to certify EarnHoney’s commitment to delivering 100% human traffic to our advertising partners. This will benefit our community by allowing more and more advertisers to join us. Please keep posted on this topic. 6/15/2015: A new gift option is available. For certain users, having a verified Paypal is impossible. To respond to the demand, we have added an option for Paypal (Unverified Accounts) to our redemption package. There is a slight charge for the additional processing necessary. 6/10/2015: There are some exciting changes today! We have added back one of our survey partners, and added a new one to boot. The ever popular Peanut Labs surveys and offers is available for EarnHoney users. As always, we strive to have the highest payout percentage in the industry, so let us know if you find someone that gives out more for the same offer. We will match or beat it! For a limited time, we are giving away 30% more HD$ for each survey or offer completed. The bonus points will be tallied and calculated at the end of June. On a different note, we have changed the videos and game page layouts slightly. Please refresh your screens to download the latest CSS. 1. Increased the payout ratio 30% for both games and videos. 2. Added playlists to Games section. When viewing play lists, you can toggle between “play one” and “play list”. 4. The “Time-out” when running out of ads has been reduced to 5 minutes. 5. Our system has been tested to deliver up to 3MM videos daily. Peanut Labs and other surveys will be released this week. 4. Implement a “time-out” of one hour for users that have ran out of advertiser inventory. Users will still be able to use surveys and Peanut Labs, but not ad-supported pages. 5. Upgrade our system so it supports delivering 2+ million videos clips a day. 6/3/2015: One particularly malicious strain of bot has surfaced recently. This bot was posted on thebot.net among other sites. Abusive users were able to increase their nectar without watching a single ad, which is against the Terms of Service. We have taken steps to ban these users and block their IP ranges. Some legitimate users who share IP blocks with abusers might have gotten banned as well. Just contact support and we will fix it. Videos shown: Over 1.2M clips per day. Over 50 TB of data transferred per day. Referral program: Over 500,000 HD$ has been earned by our referral partners this month. Final numbers come out on June 5th. 5/20/2015: New event for earning more HD$. June is our Customer Appreciation Month, and we will be highlighting videos of our customers! Earn 100 HD$ for every video that we use – we are looking for at least 300 videos, so everyone is a winner. Submit a video of you using or introducing a product that you could/did buy with the rewards from EarnHoney.com in one of the following categories: consumer packaged goods, auto accessories, over the counter drugs and health products, or computer accessories. All selected videos will be the property of EarnHoney. Each user can submit up to 20 videos. Honey will be credited to your account by the end of the contest. Many will enter, many will win! 5/17/2015: A lot of news this weekend. First of all, there was an Azure-related outage from 9 PM Saturday to 4 AM Sunday. Initially, the site was inaccessible, and then the videos were inaccessible. Our tech team has finally resolved the issue. Sorry everyone for the inconvenience. Starting next week, due to advertiser preference, we are going to shorter 1 minute clips with only 1 ad per clip. This higher quality inventory is to increase the available pool of ad inventory to our users. As we keep growing (we went over 2000 simultaneous users! ), we need to attract bigger and bigger pools of advertisers and this will help us do that. There might be some initial variations in earnings, but this should increase the nectar/ad at least 20%. We are still keeping our earning limit at 100 HD$ per hour. Finally, we will be restarting surveys and Peanut Lab surveys for our users in the coming week to our fans that like offers and surveys. 5/13/2015: Some good news today. Thank you everyone who helped send in crash reports. We got a lot of data and is combing through them. Thank you specifically to the Reddit community where someone organized all the reports into a template. We are going to stop the 10HD$ contest for now, while we dig into the issue. We have added an advertising partner in Canada and in the UK. This might allow a better experience from our Canadian/UK visitors. Give it a try and see how it is. Finally, we have near real-time reporting of referrals. While you won’t see the final payout until the next month, it will at least allow you to get an idea of who is signing up under you. Just a quick reminder, the Brand Ambassador program is accepting applications. You can make up to 15% instead of the standard 10%. See details here. 5/12/2015: RTB has been active for the last 2 weeks. We did a quick analysis on what is working and what isn’t working. We did this study over all users, so individual results can vary. tldr: advertisers want engaged users, so you can increase your earnings by up to 117% by actively watching and engaging with the ads that interest you. 5/11/2015: Winner of last week’s $25 Amazon GC for best feedback goes to poti4934. Congrats! We ONLY allow human users, to earn HD$ by playing videos and ads that are visible. Period. Anything else is not allowed in our Terms and Conditions, and not allowed by any of our advertisers. 5/6/2015: Due to unexpected demand (we are over 20,000 users with over 1,000 people online at the same time), we had a couple of outages today. Fixed it, but please bear with us as we deal with the “Reddit” effect. 5/6/2015: Please check your referral bonus. It has been credited. #1 was our friend over at Reddit with 300+ new users. Congrats everyone! To check, click “Invite” on the top menu bar, and then “My Invites” on the left menu bar. 5/5/2015: Website crashing should be minimized while watching videos/games. If you are still getting crashes, please contact us. We changed all the videos to MP4 format which takes less CPU/memory to process. 5/5/2015: Just 10 days left to post a picture of your earnings on Facebook, and get a chance to double your redemption. 5/3/2015: We are sending out the honey bonus for referrals for April tonight. Please check it by the end of business tomorrow. 5/3/2015: For more clarity, we are capping video/advertising earning to 100 HD$ per hour per user account. As before, please have only one account per user. Anyone earning more than this amount will be flagged. Check if you have an ad blocker on. Try a new video, is it still happening? Contact us with timestamped screen shots of the page with ads running and the honey count. We will reimburse you for any lost earnings. There might be a bug, and we will reward you handsomely for helping us squash it. 4/29/2015: Due to a lack of advertising demand, we are only allowing users from United States at this point. Canada and United Kingdom users should contact us whether they wish to continue using our service. As we expand our advertising partners, I will share that information with everyone. 4/28/2015: Some people have been receiving zero nectar after watching an ad. The problem has been fixed. It was a problem with the time-out value. Engagement: How engaged are you with advertising content? The more engaged the better. Frequency: How often have you seen this ad? Obviously, the 100th view is not as valuable as the 1st view. You will always receive at least 1 nectar for any ad. 4/27/2015: NEW! Post a picture a picture or video of what you purchased on here with your EarnHoney gift card for a chance to double the value. *Drawings end on 5/15/2015, and it is free to enter. One winner per 100 entries. Brand ambassador program: receive up to 15% of your referral’s earnings. Faster survey updates. Apologies that so many people are getting disqualified. Shockwave/Flash is still locking up users. Unfortunately, this is caused from VPAID advertising. The benefit of VPAID is that it provides a richer user experience. The negatives is that some of the ads cause memory leaks. Hopefully, the advertisers will fix this ASAP. 4/22/2015: Some players have been disqualified for having multiple browsers open. Contact us if you would like to reinstate your account, but promise not to break the rules again. 4/21/2015: The $25 Amazon GC weekly winner is…..
4/18/2015: We are implementing real-time bidding for your time. Networks can bid in real-time for your viewership based on your demographics, engagement with advertisement, and other metrics. We will then share these earnings with you. tldr: Game and Video earnings will be based on real-time bidding from networks. 4/14/2015: Win $25 gift cards: Submit feedback, bugs, advice on our Contact Us page for entries to the weekly $25 Amazon gift card drawing. 4/14/2015: There has been intermittent times of lag while we are coping with the increased load. Having add nearly 400 new users in the last 24 hours, this is both exciting and a curse. Our developers are working very hard to fix these issues. Please bear with us. 4/14/2015: Like some other survey sites you might know, Brands dictate the rules when it comes to who can participate. We are tweaking our algorithm right now to provide a better experience. Stay tuned!